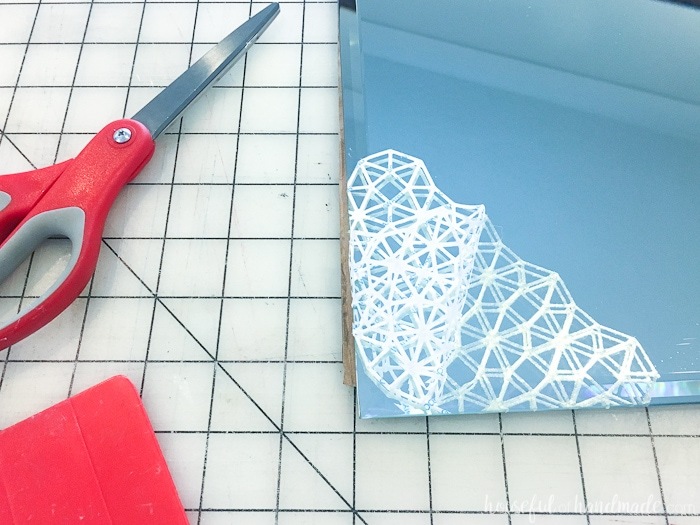 Make sure your adhesive sheet is clear or you will see it in the reflection of the mirror. You need a brush that is a bit firm to flake away the excess copper leaf. 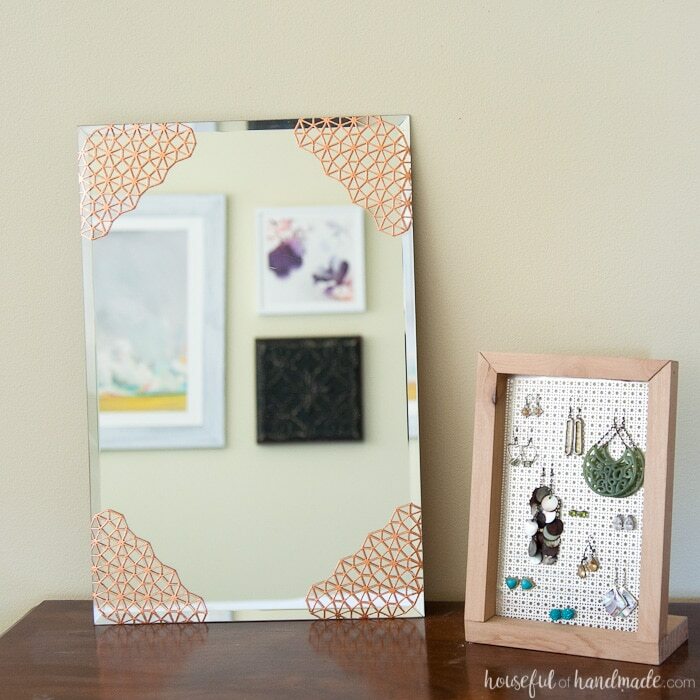 Start by deciding how you want your copper accents to be on your mirror. I cut a template with my die out of scrap paper so I could hold it up to my mirror to see where I wanted it. 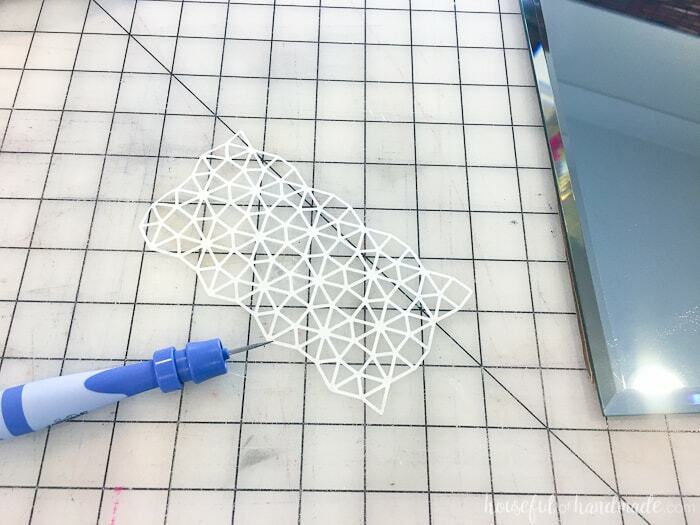 Cut the die out of the double-sided adhesive sheet. 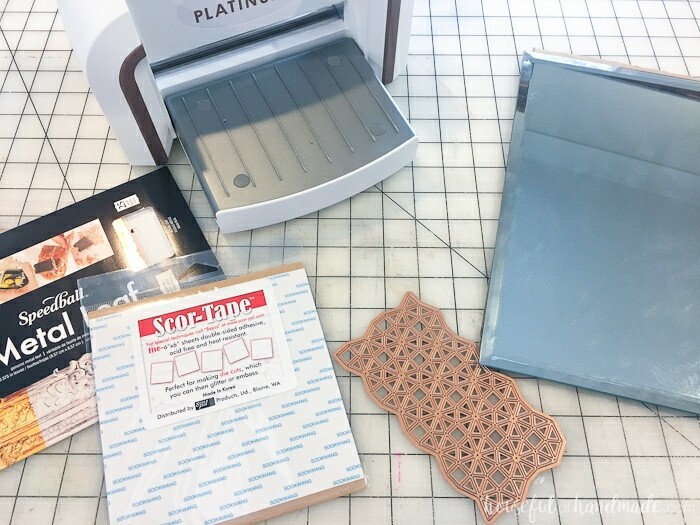 Create your cutting sandwich by layering the cutting platform, the cutting plate, topped with the adhesive sheet, then the die facing the adhesive sheet, and topped off with the second cutting plate. Run it through the machine. I ran it through forward and backward to get a clean cut through the adhesive. 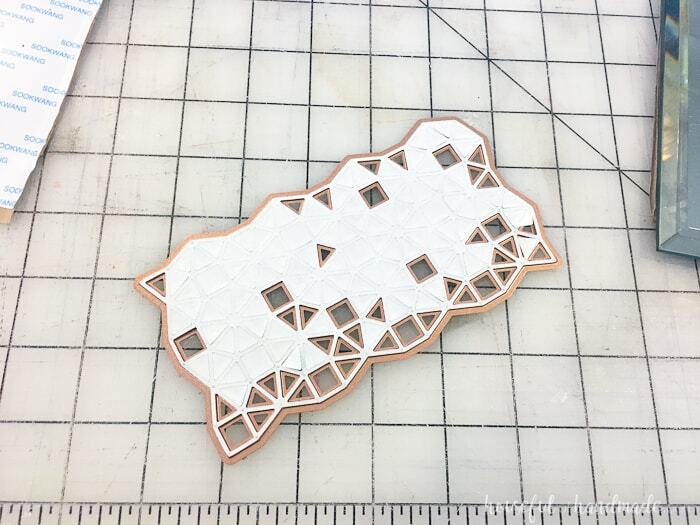 It did not cut through the backing of the adhesive sheet, but the adhesive was cut nicely. Weed out all the little pieces. The Tool ‘n One is very handy for helping with this. Be careful the pieces you weed out don’t stick to the exposed adhesive of the part you want. Clean the mirror (I used a microfiber cloth to do this without leaving a residue). 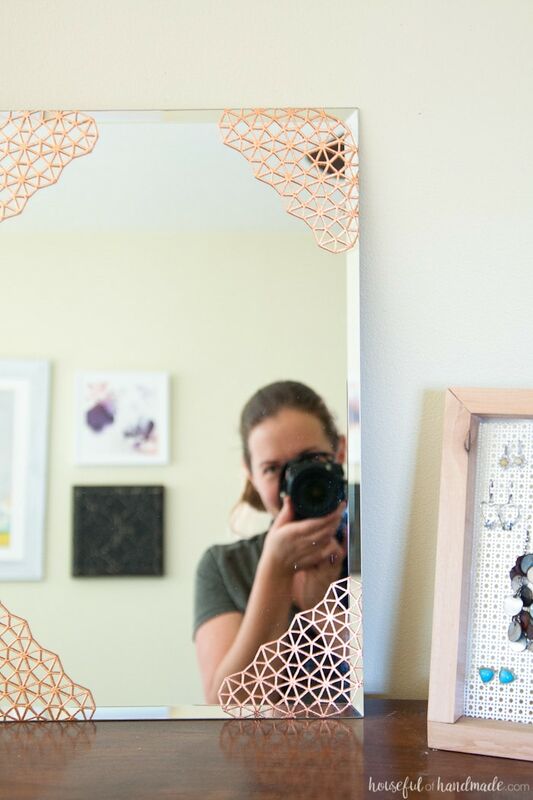 Lay the cut adhesive on your mirror, sticky side down. Using a vinyl scraper or credit card, carefully rub over the surface to make sure it is stuck down everywhere. 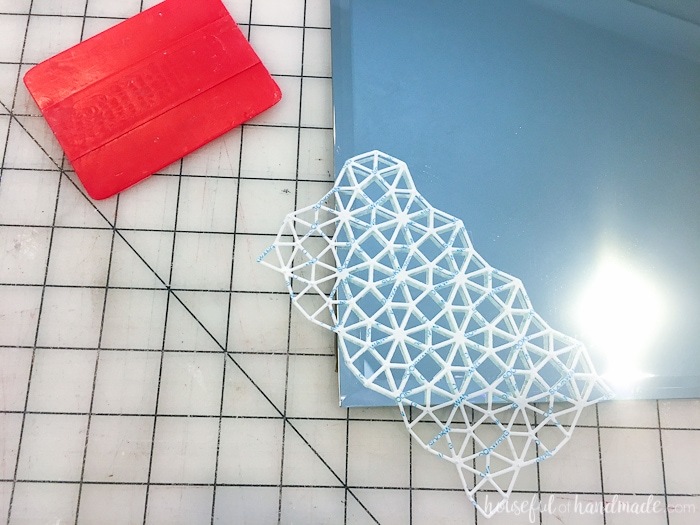 Cut away any excess adhesive and remove the backing. 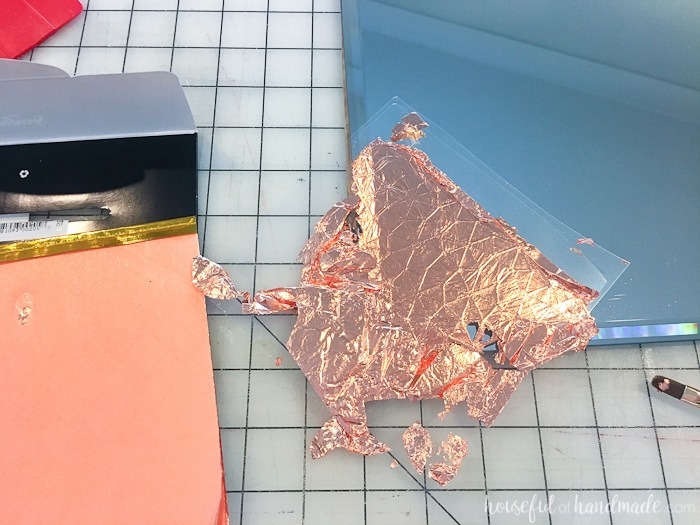 Carefully pick up a sheet of copper leaf. It is so thin that it will break super easily. The first sheet was broken more, I learned how to handle it lighter after that. Luckily there are 25 sheets in the pack so I could afford to make a couple mistakes. Lay the copper leaf over all the adhesive. 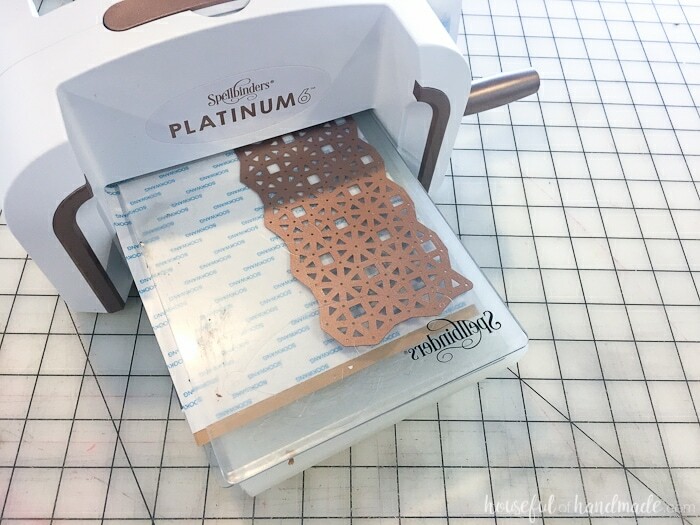 If there are any parts not covered, grab a piece from around the design and place it over it. Press down carefully so it is stuck to the adhesive. Now comes the fun part. Using your slightly firm paint brush, brush the copper leaf away from the areas you don’t want it. It should come away easily, but it will remain stuck to the adhesive. 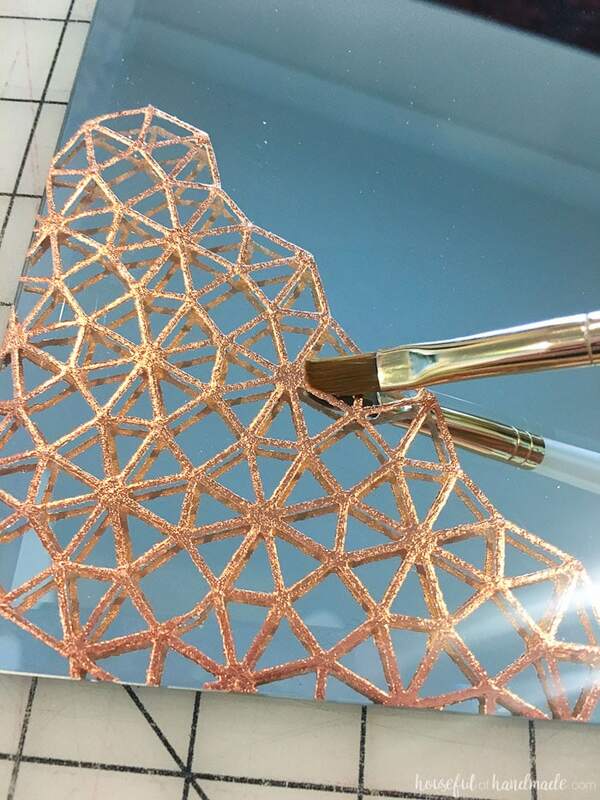 Brush the paintbrush back and forth along the edges of the design to cleanly remove the copper leaf. Continue to do this all around the entire design. Use a vacuum hose to easily clean up the flakes of gold leaf you are brushing away. Now you can sit back and admire your beautiful work, unless you have 3 more corners to work on. 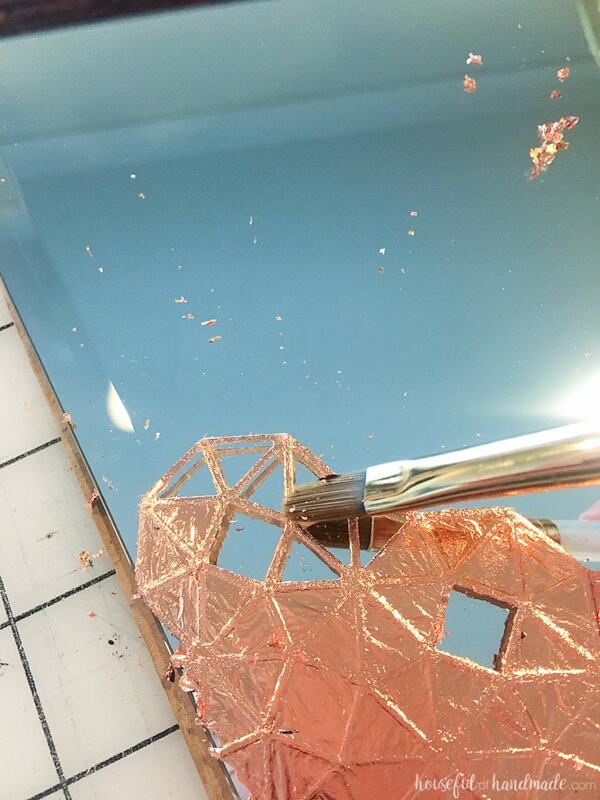 But seriously, don’t you just love the copper kaleidoscope on the mirror. It adds such a beautiful sparkle. And of course, it is near impossible to photograph mirrors without getting an “unofficial” selfie. I thought it would be fun to share one, in case you wanted to see a little behind the scenes action. What a fun little day project!